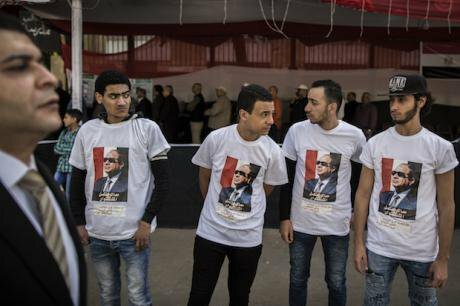 Young Egyptian men wear t-shirts with the picture of Abdel Fattah al-Sisi in Cairo, Egypt, 26 March 2018. Picture by Oliver Weiken/DPA/PA Images. All rights reserved. This might prompt further questions as to why Egypt would waste tens of millions of pounds on posters and banners for President Abdel Fattah al-Sisi, when his rivals have been muzzled and no credible candidate stands to challenge him? After all, these posters cost, according to one company I spoke with, from LE800 to LE5,000 each, mostly paid for by businesses — money that could have been better spent on hospitals and schools, or even the government’s Tahya Masr (Long Live Egypt) philanthropic fund. But the costly flooding of images across cities makes sense when one considers them to be a symptom of a deeper pathology, one in which political despotism elevates the ruler’s will and passion over rational action and debate and scuppers public welfare by turning the citizenry into a homogenous mass without any real representation. But even the most anti-democratic election can reveal much about the system and its key players. Elections are often a safety valve to manage threats.